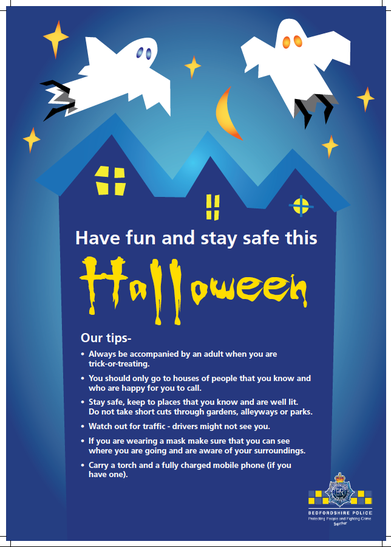 As Halloween approaches Bedfordshire Police is reminding parents and guardians to keep their children safe. If possible, parents and guardians should go out trick or treating with their children, sticking to well-lit areas and only knocking on the doors of people they know. Some people may have 'No trick or treat' posters up at their doors and we ask that these are respected. Bedfordshire Police is also reminding children and parents to be mindful that some of the more vulnerable or elderly members of the community may feel intimidated by people calling at their doors and appeals to all residents to look out for their neighbours who may feel frightened during this time. Extra patrols will be on hand over the Halloween and Bonfire Night period to ensure that the evenings can be enjoyed safely If you do have any concerns during Halloween, it's important that you call 101 in order to keep 999 free for genuine emergencies - 31 October is one of the police's busiest nights of the year!